Mighty Minds Holiday Programs are finally here! 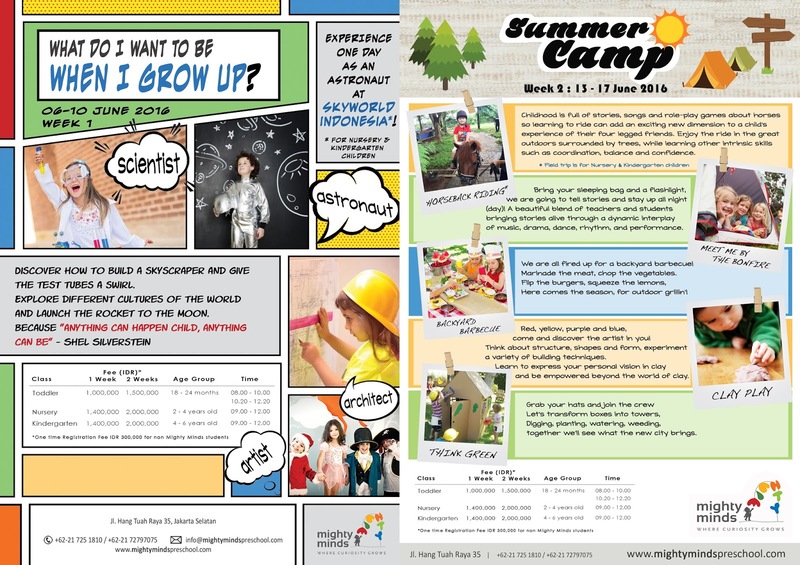 From building skyscrapers and launching rockets (Week 1), to bonfire, barbecue and horseback riding (Week 2), come grab your hats and join the fun as our Summer Programs have begun! 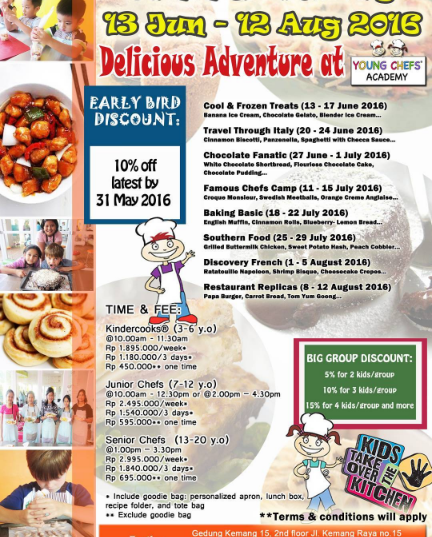 Our holiday programs will begin on Monday 6th June and run for two weeks at Center 1 (Jalan Hang Tuah Raya No:35). Classes will involve lots of fun activities including building a skyscraper from cardboard boxes, test-driving test-tubes and exploring different science experiments, exploring clay, cooking at a backyard barbecue and even a visit to Skyworld Indonesia and Horseback Riding. and get 20% discount voucher for all@aksaraindonesia Books! Venue: Ganara Art Studio inside Sekolah Kembang Kemang. Stop the summer brain drain! Let's fill up your kids holiday with Engineering For Kids' Funducational Summer Camp Programs. From 'Design the future' to 'Minecraft edu', Exploring Kelvin't Kitchen to investigate like Conan. 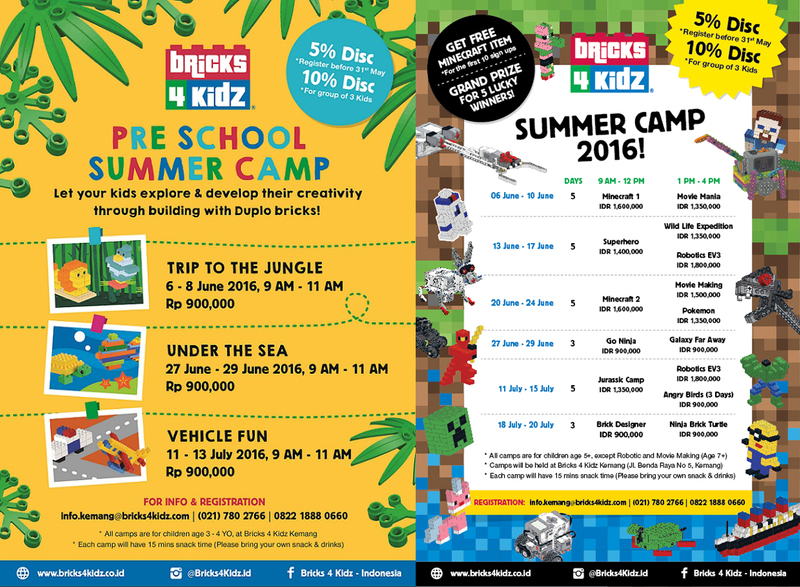 Develop Your Child’s Creativity, Logical Thinking, & Focus with LEGO® Bricks in Bricks 4 Kidz® Summer Class Program! 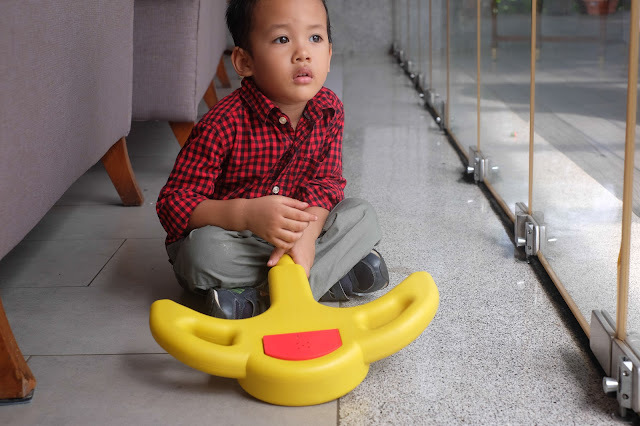 Early childhood is one of the most important stages when kids startlearning something new and developing their intelligence, emotion, and social skill. Besides parents’ influence & education on children at home, fun and creative preschool & after school activities can also help developing children’s early childhood skills like creativity, logic, focus, motor skill, patience, communication, and self-confidence. This summer program is designed to offer children 1-8 years old a fun and unique experience, with an opportunity to explore their individual talents, meet new friends, discover new interests, and create memories that last a lifetime. 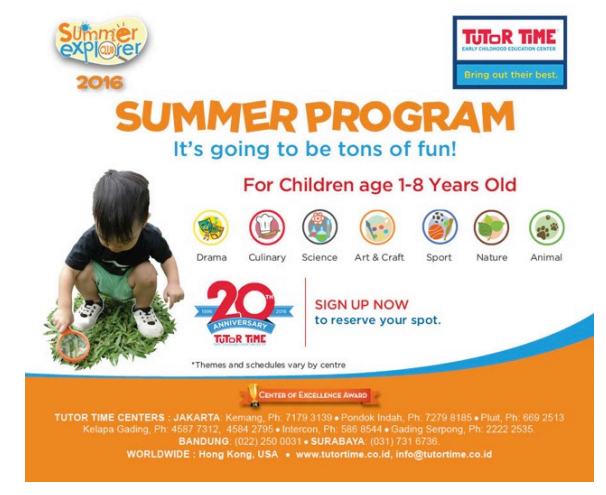 “Summer Explorer Club” is available in all 9 of Tutor Time centres located in Jakarta, Bandung, and Surabaya, from May to August 2016, with a different theme each week. A child does not have to be a Tutor Time student to enroll in “Summer Explorer Club”. (May-July 2016) Discovery Center would like to invite your child to join Celebrate with Music (4 weeks) and Animal World (4 weeks). 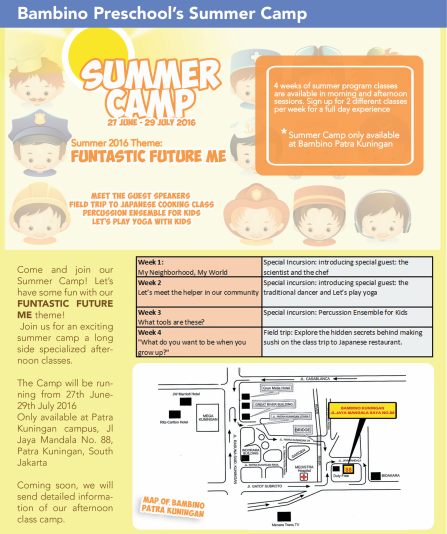 Summer camp can be joined on a weekly basis, over an 8 week period. Children aged 2-7 from all schools are welcome. Experience Stories, Drama, Puppet shows, Field Trips, Fancy Dress parties, Paddling Pool, Cookouts, Games, Special Projects, Art projects, science, dance, music, and cooking will reflect the theme. Fill your summer holiday with amazing musical journey with Ensiklomusika's summer classes. We have group programs for age groups: 2-3 years old, 4-6 years old, elementary and high school students, adults, and seminars for advanced students and musicians. 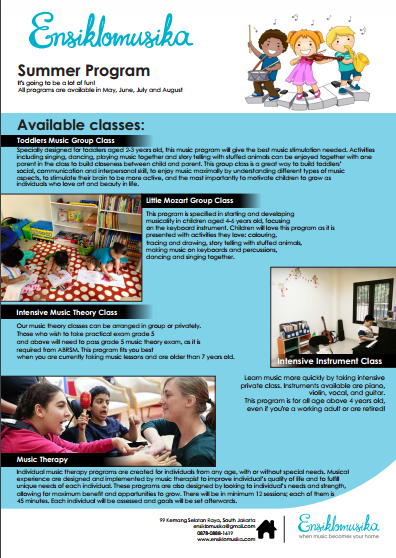 Intensive private classes include: Intensive Music Theory, Intensive Instrument, and Music Therapy. All classes are available in May, June, July, and August 2016.
www.ensiklomusika.com for detailed program information. Call 0878-0888-1619 (Rose) or email to ensiklomusika@gmail.com to enroll. Join us for a learning journey together at Bambino international Preschool with numerous activities that will be truly memorable for your children. 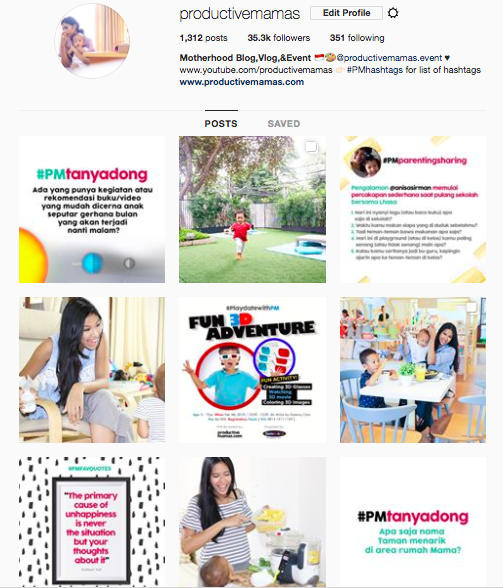 Through this year's theme, "Funtastic Future Me" we give children a chance to think about what they might want to do when they grow up which helps to motivate them and encourage their imagination. Even something as simple as a walk around school can open their eyes to all of the jobs there are in a school. In Summer Camp FUNtastics: Gymnastics, Dance, Ballet, Yoga, and Martial Arts. 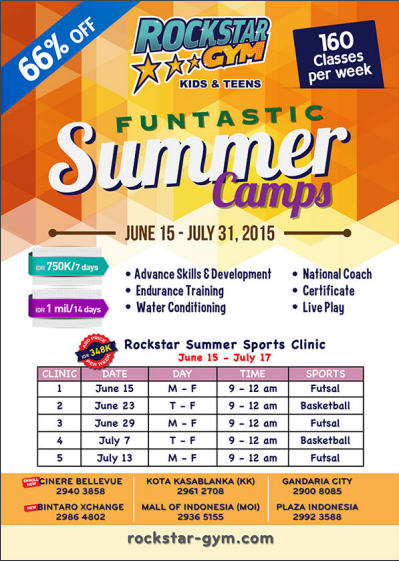 Available at all RockStar Gym branches for kids 6 months – 16 years old from June 15–July 31, 9 AM–6 PM. SUMMER SPORTS CLINIC: Available at Rockstar Gym Kota Kasablanka from June 15–July 17, 9 AM–12 Noon. What kind of activities? 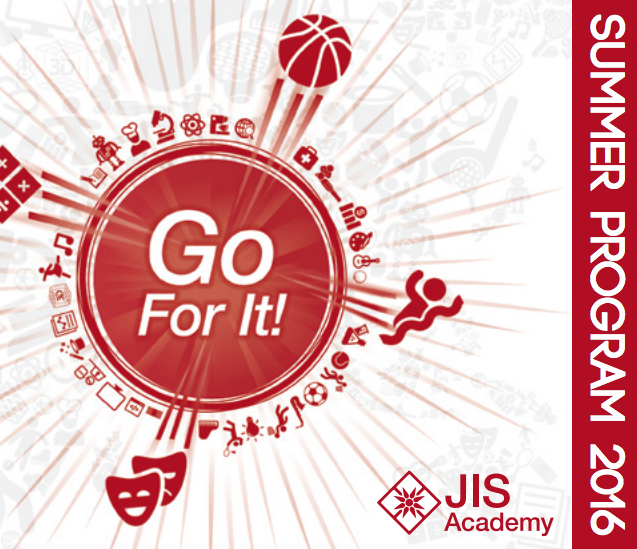 Futsal and Basketball for kids 4 years old – 16 years old. Six highlighted points: Advance Skills & Development, National Coach, Endurance Training, Certificate, Water Conditioning, and Live Play. 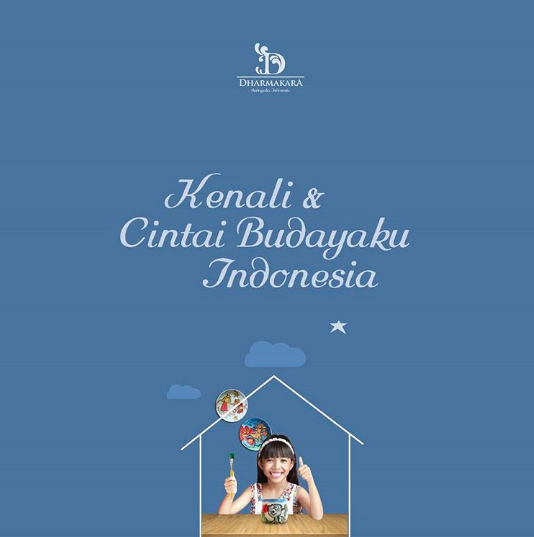 This program fee starts from IDR 348.000/week! For further information call, check out for the nearest branch www.rockstar-gym.com . Ada yang punya tambahan akan program summer classes di tahun 2016? Let me know in the comments below!